A hip fracture is a break in the thigh bone (femur) of your hip joint. Joints are areas where two or more bones meet. Your hip joint is a “ball and socket” joint, where your thigh bone meets your pelvic bone. The ball part of your hip joint is the head of the thigh bone. The socket is a cup-like structure in your pelvic bone, called the acetabulum. Hip fracture is a serious injury and requires immediate medical attention. About 90 percent of hip fractures happen to people older than age 60. The incidence of hip fractures increases with age, doubling for each decade after age 50. Caucasians and Asians are more likely to be affected than others, primarily because of a higher rate of osteoporosis. Osteoporosis (loss of bone tissue) is a disease that weakens bones. Women are more prone to osteoporosis than men; therefore, hip fracture is more common among women. They experience about 80 percent of all hip fractures. More than 1.5 million Americans have fractures annually because of osteoporosis. Either a single break or multiple breaks can occur in a bone. A hip fracture is classified by the specific area of the break and the type of break(s) in your bone. Femoral neck fracture. A femoral neck fracture occurs 1 to 2 inches from your hip joint. This type of fracture is common among older adults and can be related to osteoporosis. This type of fracture may cause a complication, because the break usually cuts off the blood supply to the head of the thigh bone, which forms the hip joint. 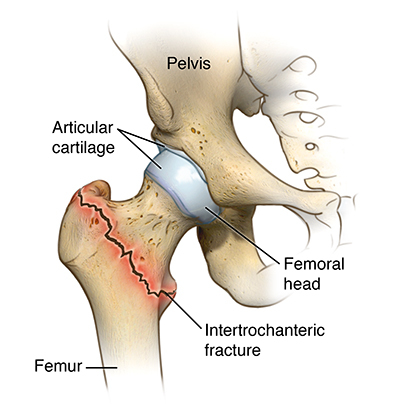 Intertrochanteric hip fracture. An intertrochanteric hip fracture occurs 3 to 4 inches from your hip joint. This type of fracture does not interrupt the blood supply to your bone and may be easier to repair. Around 90 percent of hip fractures fall into these 2 categories in relatively equal numbers. Another type of fracture, called a stress fracture of the hip, may be harder to diagnose. This is a hairline crack in the thigh bone that may not involve your whole bone. Overuse and repetitive motion can cause a stress fracture. The symptoms of this injury may mimic those of tendonitis or muscle strain. A fall is the most common reason for a hip fracture among the elderly. 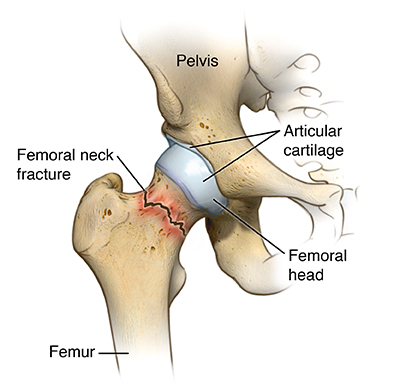 A small percentage of people may have a hip fracture occur spontaneously. If you are younger, a hip fracture is generally the result of a car accident, a fall from a great height, or severe trauma. Hip fracture is more common in older people, because bones become thinner and weaker from calcium loss as a person ages. This is generally due to osteoporosis. Bones affected by osteoporosis are more likely to break if you fall. Most hip fractures that older people get occur as a result of falling while walking on a level surface, often at home. If you are woman, you lose 30 percent to 50 percent of your bone density as you age. The loss of bone speeds up dramatically after menopause, because you produce less estrogen. Estrogen contributes to maintaining bone density and strength. What are the risk factors for hip fracture? A risk factor is anything that may increase your chance of developing a disease. It may be an activity, diet, family history, or many other things. Different diseases have different risk factors. Although these factors can increase your risk, they do not necessarily cause the disease. For example, you may have one or more risk factors for a certain disease or condition, but never develop it. On the other hand, you may not have any known risk factors, but develop the disease or condition anyway. Being aware of your risk factors for any disease can help you take appropriate actions, such as changing behaviors and being clinically monitored for the disease. There may be other risks, depending on your specific medical condition. Be sure to discuss any concerns with your health care provider. The symptoms of hip fracture may resemble other medical conditions. Always consult your health care provider for a diagnosis. Magnetic resonance imaging (MRI). A combination of large magnets, radiofrequencies, and a computer produce detailed images of organs and structures within your body. Computed tomography scan (also called a CT or CAT scan). A combination of X-rays and computer technology produce horizontal, or axial, images (often called slices) of your body. 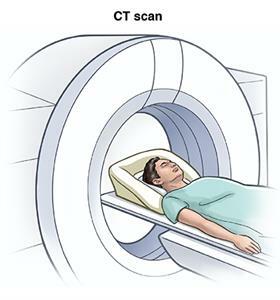 A CT scan shows detailed images of any part of your body, including your bones, muscles, fat, and organs. CT scans are more detailed than standard X-rays. A fracture of your hip is generally treated with surgery. Your surgeon may use metal devices to strengthen and stabilize your joint. In some situations, he or she may do a total hip replacement. The type of surgical repair will depend on the type of hip fracture. Your surgeon will determine the best procedure for you, based on your individual situation. The goal of treatment is to provide relief from pain and enable you to resume your normal activity level. Hip surgery usually requires an in-hospital stay. While in the hospital, you begin doing physical therapy exercises to regain strength and range of motion in your hip. Physical therapy will continue at home or on admission to a rehabilitation facility. What are the complications of hip fracture? Serious complications can result from a hip fracture. Blood clots can occur in the veins, usually in your legs. If a clot breaks off, it can travel to a blood vessel in your lung. This blockage, called a pulmonary embolism, can be fatal. With some fractures, blood cannot circulate properly to the head of the thigh bone, resulting in a loss of blood supply to this area. This is called femoral vascular necrosis, or a vascular necrosis. This complication may occur, depending on the type of fracture and the anatomy of your blood supply to the head of the thigh bone. This is more common with femoral neck fractures. If you sustain a hip fracture, you are more likely to die than someone your age who does not experience this injury. About 20 percent of people who have a hip fracture die within a year of their injury. It is estimated that only 1 in 4 people have a total recovery from a hip fracture. Most people spend from 1 to 2 weeks in the hospital after a hip fracture. The recovery period may be lengthy, and may include admission to a rehabilitation facility. If you were previously able to live independently, you will generally need help from home caregivers or family, or require the services of a long-term care facility. Hip fractures can result in a loss of independence, reduced quality of life, and depression, especially in older people. Can a hip fracture be prevented? Preventive measures include taking enough calcium every day. If you are a women past menopause who is not taking estrogen, the National Institutes of Health (NIH) recommends 1,500 milligrams (mg) daily. If you are a woman past menopause who is taking estrogen, the recommendation is 1,000 mg. Middle-aged men should take 1,000 mg daily. If you are a woman at menopause, you should consider having a bone density test. This measures your bone mineral content and the thickness of your bone. This measurement can indicate decreased bone mass, a condition in which your bones are more brittle and more prone to break or fracture easily. A bone density test is used primarily to diagnose osteoporosis and to determine fracture risk. Women, who sustain the majority of hip fractures, produce less estrogen when menopause begins. Most people do not know they have osteoporosis until they sustain a fracture. Another way to help prevent hip fracture is to engage in regular weight-bearing exercise, such as walking, jogging, or hiking. Exercise programs such as Tai Chi help promote strength and balance. About 90% of hip fractures happen to people older than age 60. The incidence of hip fractures increases with age, doubling for each decade after age 50. Hip fracture is a serious injury and requires immediate medical attention. A fall is the most common reason for a hip fracture among the elderly. Hip fracture is more common among women. Osteoporosis and advancing age are the major risk factors. A fracture of the hip is generally treated with surgery. Serious complications can result from a hip fracture. Preventing a hip fracture is more desirable than treating one. Women at menopause should consider having a bone density test. Regular weight-bearing exercise helps to prevent a hip fracture.